The Weymouth Life Group was formed in 1980 to provide counselling and caring and support to women and young girls in the Weymouth area who had a crisis pregnancy. 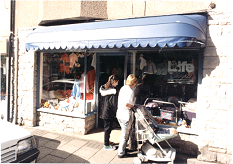 In 1992 we opened a charity shop at 8 Great George Street in 1992, selling excellent quality baby and children’s clothes, toys and equipment. While more recently we have have offered adult clothes, videos, bric-a-brac and books, the shop is still predominantly a children’s charity shop and unique to Weymouth. The profits from the Charity Shopsupport the Pregnancy Care Centre, which is above the shop, and has a separate entrance. In recent years, the Group has taken over responsibility for the membership of the Dorchester and the Yeovil LIFE Groups. That is why we are now called Weymouth and District. Naomi, the manageress gratefully accepts donations of all types – baby and children’s clothes, toys and equipment, adult clothes, books etc. The shop runs a 'gift aid' scheme. Donors are encouraged to sign up to gift aid. This means that the LIFE can recoup some 28% of the price at which the goods are sold. She is are always looking for volunteers to assist in the shop for half days or full days. Ladies, if you are interested, why not pop into the shop and speak to the Manageress? Could you help in LIFE’s work? According to the most recent statistics, in there over 200,000 abortions in England and Wales each year and growing by about 2% per annum. With a birth rate of 669,901 in England and Wales, this means that over one fifth of pregnancies end in abortion each year. And yet we still have people standing up arguing that abortion should be made easier. The Weymouth and District Group has been in existence for over 27 years and thanks to the shop and its Caring work it has a good reputation in the town and is considered to be part of the community. We continuously need new members and new helpers to ensure that this work continues.